Koalas are already considered extinct in Avalon, north of Sydney, and are in danger of disappearing from many other parts of Australia. The iconic animal that tourists queue up to cuddle is suffering the ravages of disease and sustaining horrific injuries on logging plantations. As koala habitat continues to be destroyed for urban and industrial development, thousands of the animals are dying as a result of car hits and dog attacks. Bushfires continue to kill thousands more. Koalas eat mainly eucalyptus leaves, and only from certain species of gum tree. At Australia’s recent national koala conference – “Their Future is in our Hands” – speakers called for immediate and collaborative action to save the animal. Fleet the koala, who died two months after being riddled with pellets from a slug gun. Photo by Meghan Halverson. In 2012, the koala was listed as vulnerable in Queensland, New South Wales, and the Australian Capital Territory, but campaigners say this is not enough and the animal should be listed as endangered throughout the country. The Australian Koala Foundation is drafting a Koala Protection Act, which it intends to have tabled in parliament after the September elections, most likely in early 2014. Even if the Act is eventually passed, the process is expected to take several years. Ironically, in the United States, koalas have been listed as a threatened species since 2000. 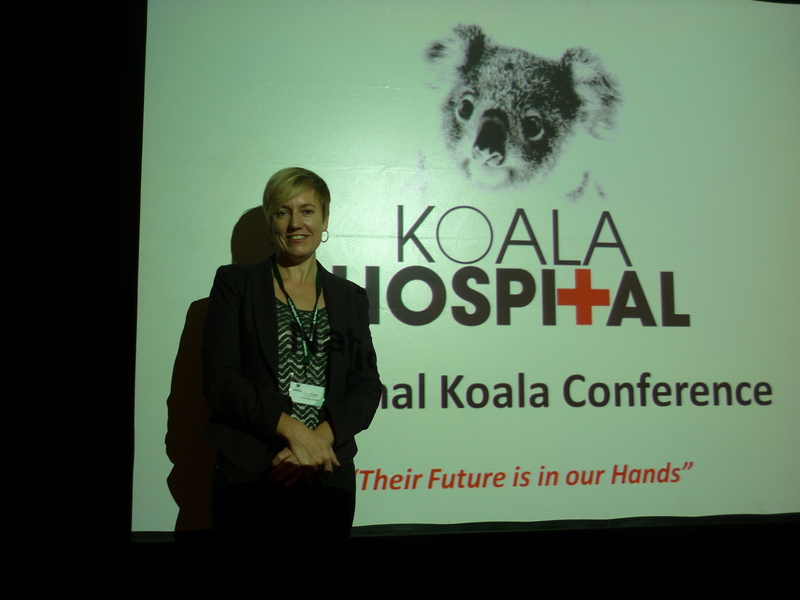 The three-day koala conference, held in May in Port Macquarie, New South Wales, was organised by the town’s koala hospital, with the backing of the local council. It brought together carers, campaigners, scientists, and veterinarians from many areas of Australia, and abroad. Scientists talked about chlamydia and their work to develop a vaccine against the disease, which can cause blindness and sterility and can be fatal. Carers talked about rescuing injured animals and translocating koalas that are being pushed out of their traditional habitat by urban development and mining and other industries. Individuals and groups are fighting continuous battles against developers and logging companies and are campaigning against such practices as controlled burning, which has been shown to be ineffective in reducing the effect of bushfires and is also taking koala lives. Another problem is companies harvesting blue gum trees without a thought for the koalas who live in them. There are small signs of hope, with some koala populations recovering, a few small areas of habitat being saved, and some translocations working well, but, overall, koala populations are declining fast. At Port Macquarie, Sue Brookhouse, from the Office of Environment and Heritage in Coonabarabran, had conference delegates in tears as she spoke about the fire that swept through the Warrumbungle National Park in New South Wales in January 2013. She told of blazes that were fierce enough to split rocks apart and devastated 53,000 hectares of land, including 90 percent of the national park. She told how drought had already dramatically reduced koala numbers even before the fire. There is now only one koala left in the park. In the 2012 wildfires, more than 200,000 hectares of land were burned. “On top of that, 250,000 hectares have been burned for fuel reduction this year,” Wood said. “If we continue burning at this rate, and have to deal with wildfires as well, every inch of forest in Victoria is going to be gone in seven years’ time. We’re going to obliterate our wildlife. 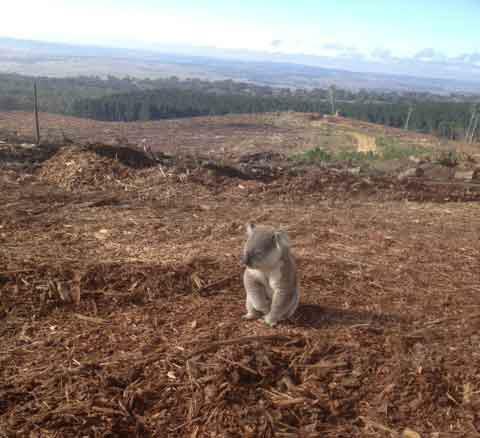 One koala Wood rehabilitated after a fire got caught up in another blaze, set by an arsonist, two years later. The animal fell on a burnt branch and had to be euthanised because of the condition of her lungs. Greens MP Cate Faehrmann told Port Macquarie delegates about plans to raze almost all of the Leard state forest in northern New South Wales for three open-cut coal mines. “Five thousand hectares of woodland would be cleared and this includes 550 hectares of endangered box gum woodland. This is a critical habitat for koalas and many other threatened species. “Fragmentation of these habitats makes koalas more vulnerable to risks like cars, dogs, bushfires, and disease, and increases the risk to all of the other species as well. Faehrmann also spoke about the clearfelling of forest “to feed the insatiable export pulp and paper industry”, and illegal logging in national parks. She said koala numbers in New South Wales were already in rapid decline, having fallen from about 31,400 in 1999 to about 21,000 in 2010. Faehrmann fears that if a new coalition government is voted in in the September elections, that government may hand more power back to individual states and even scrap the Environment Protection and Biodiversity Conservation Act. 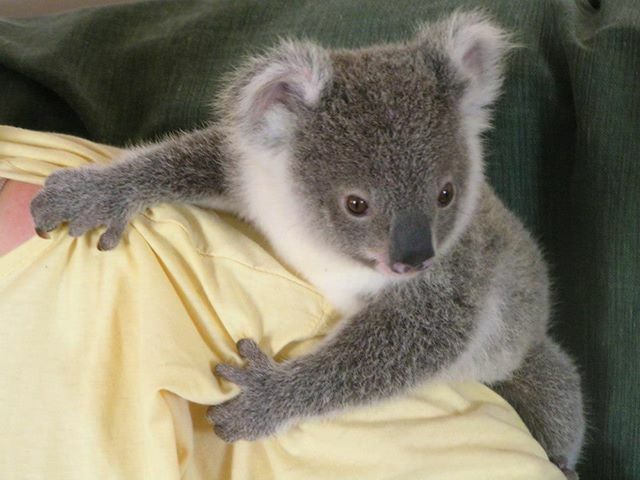 When European settlers first arrived in Australia, there were ten million koalas in the wild. There are now a few hundred thousand at most. A senate inquiry in 2011 was told that there are probably between 50,000 and 100,000. Over the past twenty years, koala numbers have dropped by 40 per cent in Queensland and by a third in New South Wales. In the Pilliga Forest of northwest New South Wales, three-quarters of the koala population has been wiped out since 2000. A koala being fed at the Port Macquarie hospital. One of the many urban developments threatening koala habitat is Kings Forest in northern New South Wales. It’s an area where the koala population is already in serious decline. Only about 144 koalas remain along the whole Tweed coast. “We have a developer who is building a mini-city of 4,500 homes that will house 10,000 people smack bang in the middle of core koala habitat,” said Jenny Hoyes from Murwillumbah. The development will include a golf course and twenty hectares of sports fields. Because the koala has been listed as vulnerable in New South Wales, the federal government is now examining the project. “We are just waiting and hoping they realise that this is a complete travesty,” Hoyes said. Koala hit by a car; photo by Charlie Lewis. In Queensland, the state’s parks and wildlife policy requires koalas to be released within a five-kilometre radius of the place they were found, even though the area may be totally unsuitable, with insufficient habitat and high risk factors. Carers see rehabilitated koalas being killed soon after release, or ending up back in hospital after car hits or dog attacks. 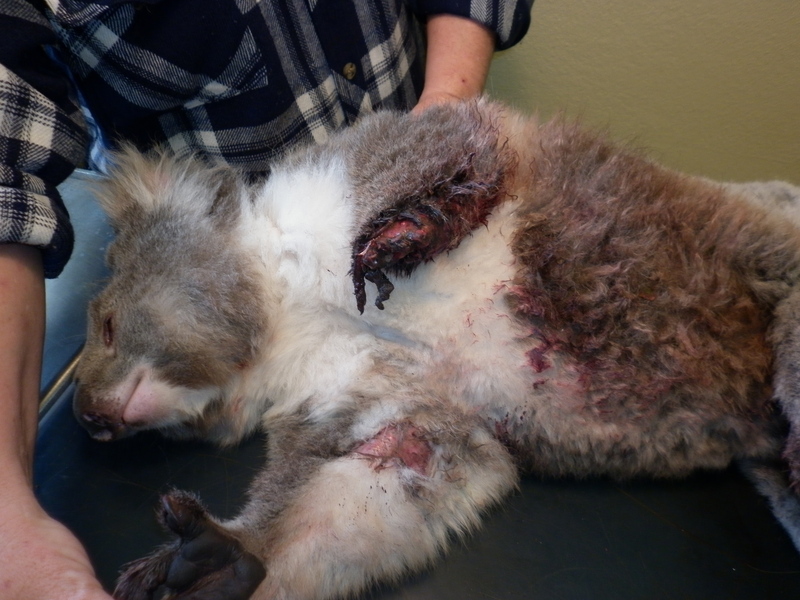 In southwest Victoria, hundreds of koalas have been injured during blue gum harvesting. In one of the most shocking cases, an animal recently had its arm severed. Koalas come to feed on leaves in the plantations, but lose that habitat once the trees are harvested. On some plantations, there aren’t even spotters to check there are no koalas in the trees before those trees are felled. Huge harvesting and haulage machines are used, and wood chipping is often done on site. “Impact injuries are common,” Wilson said. “It is also not unusual for koalas to be found still alive a couple of weeks later, slowly dying from injuries and starvation. Wilson says that when a blue gum plantation is planted, a percentage of the area should be dedicated to native bush that will remain when the blue gums are harvested so that the koalas have got somewhere to go. “Thousands of hectares of blue gums are due to be harvested right now. Politically, no-one’s going to stop this harvesting because of the jobs it creates. Often, when the plantations are felled, there’s nothing but roads and paddocks left in all directions, sometimes for hundreds of acres. “We need to change that environment; we can’t go and get every koala down [from the blue gums] and relocate it. What happens when there is nowhere left to put them? The answer, Wilson says, is to plant habitat. Woodchip from the blue gums is exported for paper production and Japan and China are the main buyers. Another major issue is translocation – carried out because of urban and industrial development or perceived overpopulation. Koalas have been moved onto the mainland from islands in South Australia and Victoria, but carers say translocations have been done without proper population assessment, and are unnecessary. Stephen Phillips from Biolink Ecological Consultants said the mortality rate among koalas translocated from Kangaroo Island in South Australia was about 30 percent. It was about 90 percent among those translocated from French Island in Victoria, and rose to 100 percent in some cases. Phillips tells of one successful translocation carried out recently in New South Wales. 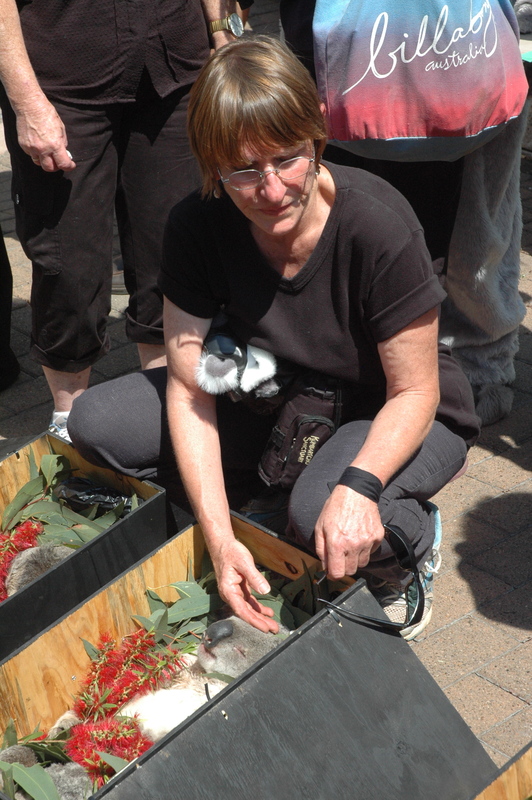 The koalas were taken from the area designated for the new Oxley highway to the Lake Innes conservation area. The animals were put into unoccupied habitat, there were plenty of available food trees, and they were put into temporary restraining enclosures, so were able to get a sense of place. Phillips said the government was failing to lessen the impacts of development, so practices needed to be put into place that minimised the potential costs to koalas of the translocations being carried out. “We need to know how to do this better so as to alleviate some massive impacts in places like southeastern Queensland. We want to maximise survival and help recovering populations. Phillips is hoping for change, or he may well carry out his threat to turn up at a politician’s house in a D8 bulldozer, dressed in a koala suit, with the message “You’ve got five minutes to get out of your house because I’m going to bulldoze it”. John Callaghan, from the Gold Coast city council, is involved in the ongoing translocation of the koala population from Coomera to Pimpama in Queensland. Up to 80,000 people will be moving into the new Coomera town centre and its surroundings. 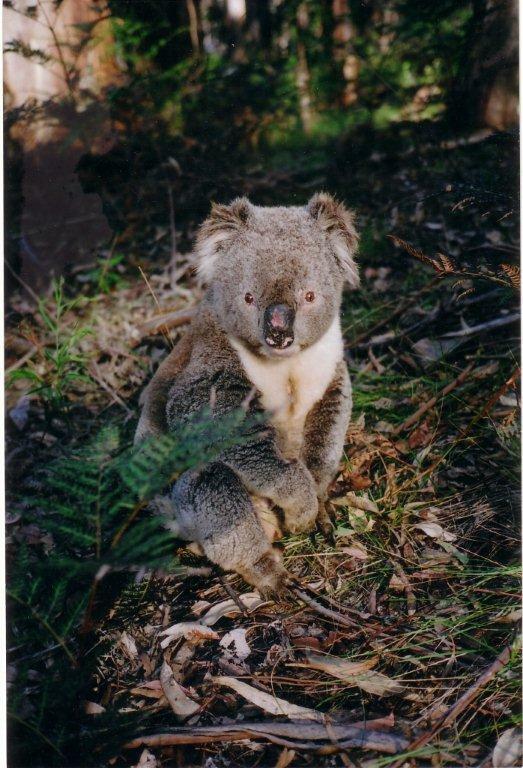 More than half of the local population of about 500 koalas lived in the area targeted for development. In a difficult and painstaking operation, 180 koalas are being relocated from more than thirty development sites and high-risk locations. All the translocated koalas undergo medical checks, and 40 percent of them have shown signs of disease. About 25 percent have shown clinical signs of chlamydia. Colleen Wood recalls a very bad translocation from Snake Island in 1999. “These animals had been vasectomised, they’d had tubal ligation, and there were mothers with pouch and back young. The surgery was done on picnic tables in thirty-degree heat. Translocations haven’t really improved, Wood says. She recalls the 2010 translocation to the fire-damaged Bunyip state park. “There wasn’t even one-third of the park left. There were animals with renal failure and with anaemia, and some of them were just downright old; they hadn’t been aged. It wasn’t even deemable koala habitat; it just broke my heart.” Carers were only able to rehabilitate about twenty of the translocated koalas. Wood said only 30 percent of all the koalas coming through her centre could be rehabilitated. Renal failure was increasing ten-fold and she was seeing more dog attacks than ever before. The injuries were horrendous. Wood sees relatively few cases of chlamydia, but says koala mange, which is caused by parasitic mites, “raises its ugly head every so often”. It can be so severe that it fuses the koala’s feet together. There can even be disasters because of well-meaning, but untrained carers. Wood cites the case of two emaciated joeys that had been kept in a box and inadequately fed. Only one pulled through. There is also the problem of a poor koala gene pool. 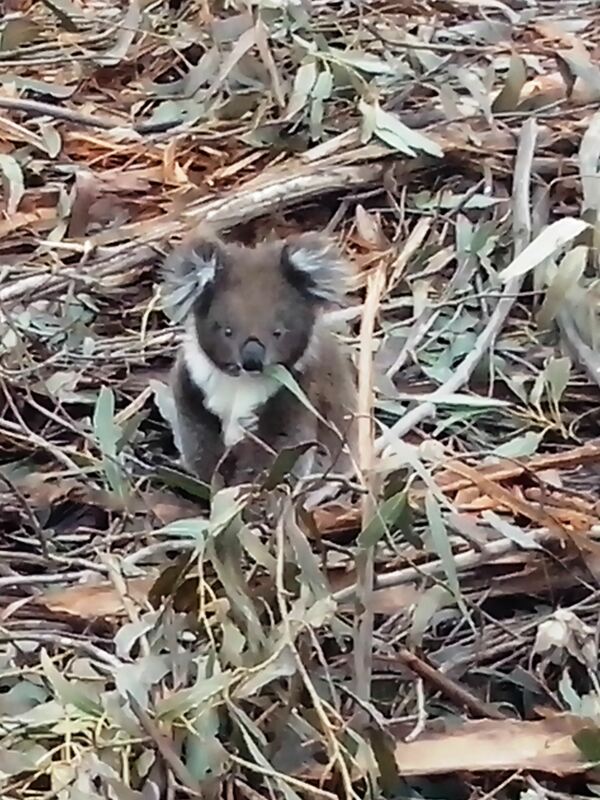 Wood sees what appears to be Down’s syndrome in the koala population at Sandy Point, south Gippsland. “They have round faces and pinny eyes; they’re very easy to handle, and they do the most bizarre things; they sit on pumpkins and they need to be boosted over the fence. There has been a dramatic decline in the koala populations in certain parts of Victoria, which wasn’t included in the 2012 listing. Wood says there are localised extinctions because of urbanisation, habitat fragmentation, tree-felling, fire, and climate change. 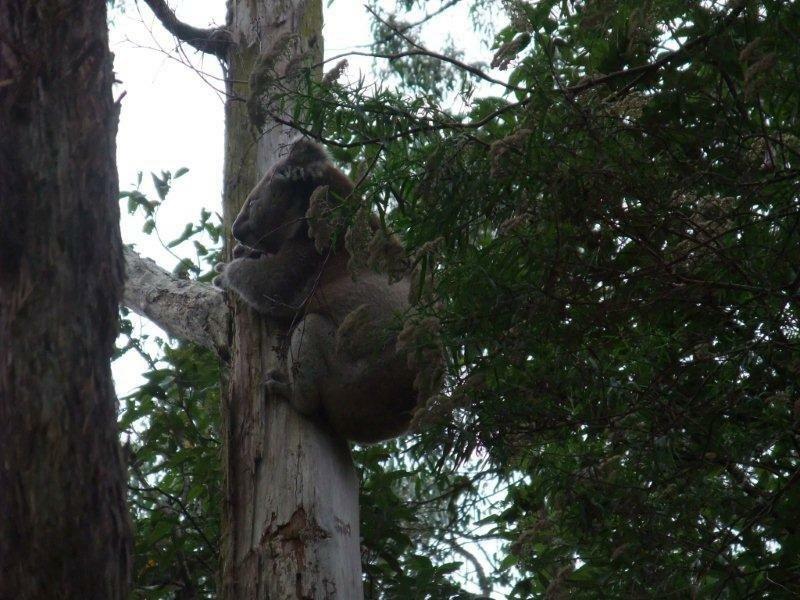 There is a particularly crucial battle continuing to save the genetically unique Strzelecki or South Gippsland koalas, who constitute the only known endemic koala population in Victoria. 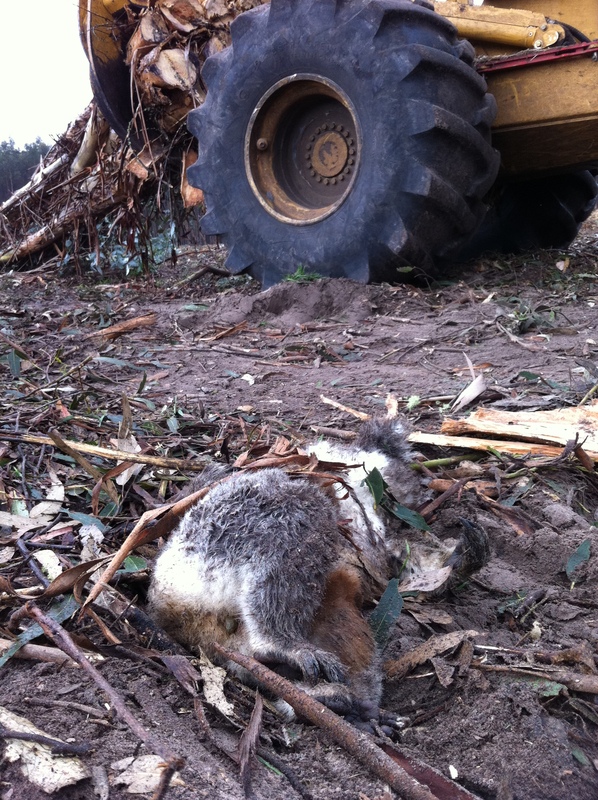 Wood says the Otways in Victoria have been over browsed and animals are now dying. “There’s not one koala left in the Wonga state park. Framlingham was renowned for having 4,000 koalas, but that whole forest has been obliterated by fire; there are probably only a few individual koalas left there now. 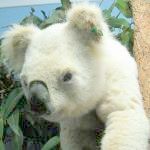 In June 2012, researchers from the Australian Centre for Wildlife Genomics at the Australia Museum started work on the Koala Genome Project, aimed at producing a draft koala genome. The genetic diversity of koalas hasn’t changed much since Europeans arrived in Australia, says Rebecca Johnson, who works on the project. Researchers from the Smithsonian Institute in the US examined koala skins from the Australian museum and, when old specimens were compared with new ones, there was a comparable level of genetic diversity. Palaeontologists have just discovered an extinct species of koala that lived in northern Australia twenty million years ago. The discovery brings the number of known extinct koala species to 18. Sequencing the koala genome will help conserve the animals, Johnson says. With accurate statistics, scientists will be able to maximise and protect their genetic diversity. Genome project researchers have discovered that the koala retrovirus, which suppresses the koala’s immune system, and is now rampant, has been around a lot longer than was suspected. The koala being used for the sequencing is Pacific Chocolate, a seven-year-old female, who was suffering from a very severe chamydial infection and was euthanised in 2012. “We’ve sequenced every piece of her DNA a hundred times. We’re also sequencing her RNA (ribonucleic acid). To date, we’ve got about 12,000 of the 20,000 or so genes we expect her to have. Before we started this project, there were less than a hundred available. It’s unusual genetics – expression of the recessive white-fur trait – that causes the little-seen occurrence of koalas with white fur. White koalas are extremely rare and carers who know where they are do everything they can to protect the animals’ location to prevent their illegal capture and sale. 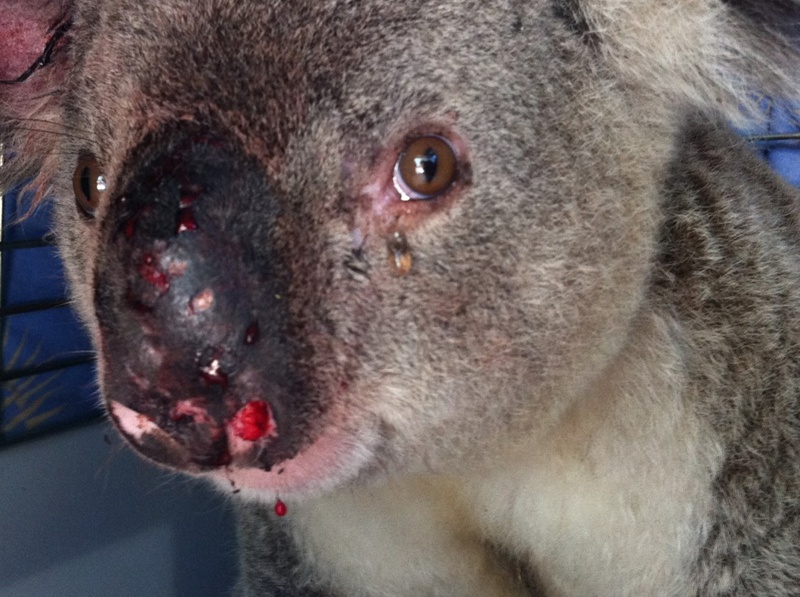 Aussie Mick, who underwent eye surgery in Port Macquarie, then was released back into the wild. Ruth Lewis from the Ipswich Koala Protection Society struck one of the few positive notes at the recent koala conference. She told how, in 2010, local campaigners got a planned freight train line moved to avoid it intersecting koala habitat. It was a rare victory for the koala, and it may be short-lived as the same habitat is now under threat again. A developer who bought the land cheaply in the 1990s is now reportedly trying to sell it, and it is an attractive site for mining companies and other industrialists. There is another positive story in the Lismore area. Damian Licari from Lismore council said a comparison between the three most recent koala generations and the three previous generations showed there was a recovery trend. Important factors are the area’s high soil fertility, the good rainfall, and the increasing availability of koala habitat. Dunoon, near Lismore, is Australia’s macadamia capital, and producers have planted rows of tallowwood trees, which are a big favourite with koalas, as windbreaks. Also, tallowwoods are growing on land that was cleared of cattle when the local dairy industry became unviable. Unfortunately for the koalas, the windbreaks have outlived their purpose and are now being cut down, so the animals again face losing their habitat. There are reports that tree clearing has been carried out without adequate precautions being taken to protect the koalas. A recovery trend has also been seen in nearby Byron and Ballina, also because of the plantation tallowwoods and rich volcanic soil, and in Gunnedah, northeastern New South Wales. Many councils now have koala management plans. In New South Wales alone, the drafting and implementation of these plans has cost close to one million Australian dollars (about 957,000 US$) since 2010. John Turbill from the Biodiversity Conservation Unit at the Office of Environment and Heritage says there has been slow uptake among New South Wales councils, but the plans that are in operation are yielding good results. “We are getting some quite good processes for analysing and mapping. The legislation may not be working across the board, but the other alternative is to sit back and do nothing. Under the plans, which only apply to private land, councils analyse koala records and do koala mapping, habitat ranking, and threat analysis. They establish assessment criteria and standards for new developments. Councils are not obliged to have koala management plans; they are a voluntary measure and there needs to be political will and proper follow-up. There are those who say the management plans are not worth the paper they are written on, but others argue that the studies and mapping help koala spotter/catchers and are a useful tool in discussions with developers. Wanda Grabowski, from “Koala Action Pine Rivers” in Queensland’s Moreton Bay region, is enraged about the hundreds of thousands of dollars being spent “pushing paper around” and says the cash would be better used buying land to provide koala habitat. “While all this writing and talking and planning and surveying and monitoring is going on, our population of koalas is going down the toilet. “We’ve had plans, we’ve had recommendations, we’ve had policies, and we’ve had local and state government legislation, and none of it has saved a single koala. A new way of gathering koala data is via smartphones. A smartphone application is being developed by the National Parks Association (NPA) of New South Wales and will be launched at the end of June. The NPA is conducting a big koala count in November this year and has developed the free app to enable local people to contribute data to this and other surveys. Gráinne Cleary, who is developing the app, will be collecting data for the New South Wales government and for the Atlas of Living Australia. Users will be able to photograph koalas in the wild, pass on the animal’s GPS location, and give details about disease, dog attacks, and car hits. Already, the public can send information to the koalatracker website, where there is a national koala map and database. The Australia Koala Foundation also has an interactive sightings and habitat-location map on its website. The AKF’s chief executive officer, Deborah Tabart, says a Koala Act, which would protect the animal and its habitat, is now the only solution. Tabart has no more faith in the system as it stands. “Every time someone tries to save a piece of koala habitat, the legislation lets them down, and industry wins very time. “Since the 2012 listing the federal government, in collusion with state governments, has sought to water down the legislation so that the listing isn’t as onerous. A new Senate inquiry would most likely be held after the Act is tabled. “I don’t see this as being achieved by next year,” Tabart said. “I see this as a three-year campaign. Until there is adequate legislation to protect Australia’s cutest creature, and solutions are found to halt the ravages of chlamydia, the daunting day-to-day struggle fought by hundreds of carers and campaigners is set to continue. 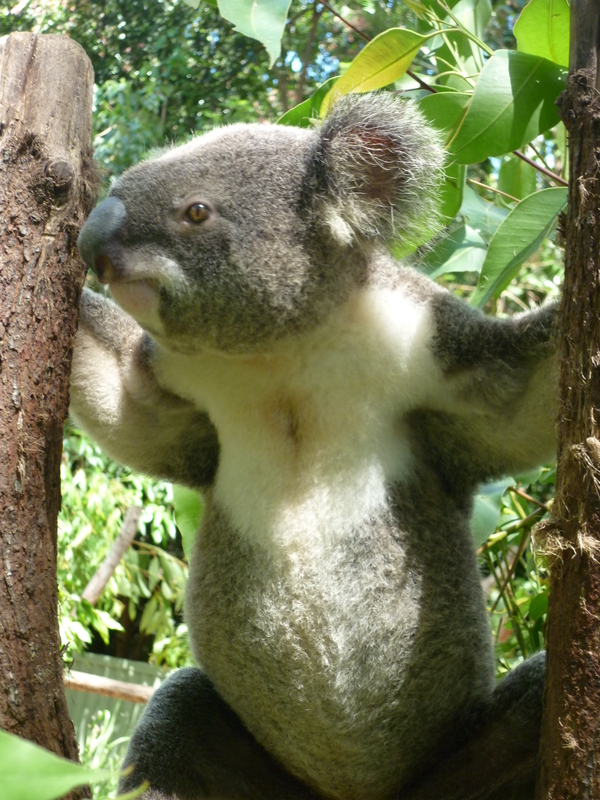 Koalas are affected by two different strains of chlamydia: chlamydia pneumoniae and chlamydia pecorum. Chlamydia pecorum is the most prevalent and the highest rates of infection are in Queensland and northern New South Wales. Many animals are infected with chlamydia, and are passing it on, but don’t show actual signs of the disease. Adam Polkinghorne from the Queensland University of Technology says scientists have probably completely underestimated the level of infection within wild populations because many studies have purely based their reporting on the presence of disease rather than the shedding of chlamydia. The Queensland University researchers hope they will soon have funding to study whether there are differences between chlamydia that causes disease in koalas and chlamydia that doesn’t. Scientists are also examining whether there is a relationship between chlamydia in koalas and the disease in cattle. “Data suggests there may well be a link,” Polkinghorne said. Researchers have been studying short pieces of chlamydia DNA. “There appear to be at least six unique chlamydia pecorum strains identified in koalas and three of those were found in Australian livestock. 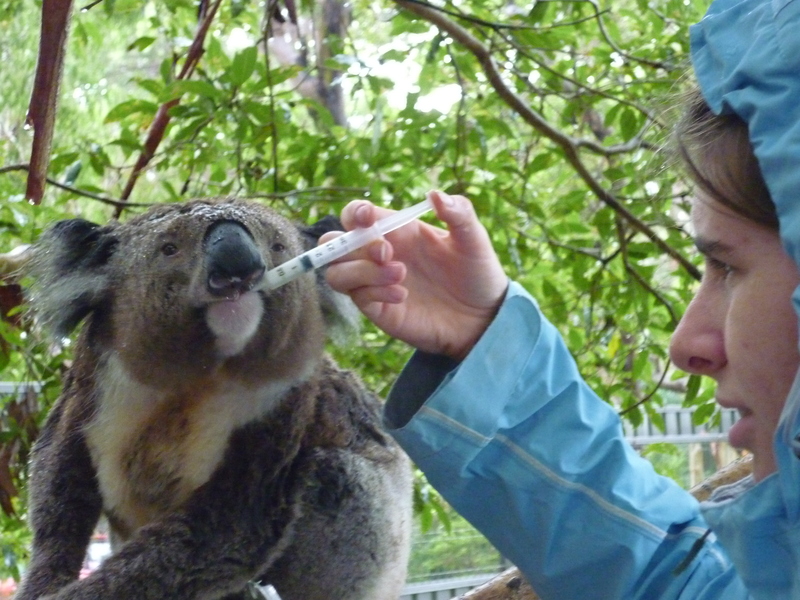 Phase one of a vaccine trial took place at the Lone Pine sanctuary near Brisbane in 2007. The aim was to decide which would be the best vaccine adjuvant to use. Phase two was carried out at Queensland’s Australia Zoo in 2010-2011. “We were able to immunise both healthy and recovered animals and show that they responded to the vaccine,” said Professor Ken Beagley, also from the Queensland University of Technology. This means scientists won’t have to develop different vaccines to treat different types of chlamydia. In preliminary studies, researchers have discovered that a nasal spray achieves the same results as injections. Questions remain about whether a “live challenge” trial –in which an animal would be vaccinated and exposed to chlamydia – should be undertaken, who would pay to produce a vaccine, and how exactly it would be used (which koalas should be vaccinated). Main image: felled pine forest near Bathurst, Queensland. Photo by Louise O’Brien. For updated information on the plight of the koala go to Queensland Koala Crusaders.